A key to enterprise architecture is application integration, not only on operational level. Large organizations are mostly using several tools in parallel, e.g. ProVision for BPA, IBM® Rational® System Architect for EA and a tool like TIBCO® for process execution. ProVision offers the Common Interface Format (CIF) for data exchange and thus for integration. Originally, CIF has been developed by Proforma to build a standard for the interchange of model and diagram data. CIF lets you “to dump” the content of a notebook (i.e. a ProVision model repository) into an XML file. So, ProVision users have built many solution scenarios around CIF. BPM-X supports CIF for the provisioning of more complex integration scenarios. In the BPM-X integration technology the reading and writing of CIF data files is made possible through a specific plugin for ProVision. In general such plugins offer so-called atomic operations which are used to compose data transformation workflows. This enables bigger organizations to manage their enterprise management tool landscapes according to their special needs and requirements. 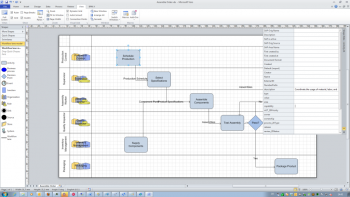 In this way ProVision can be used for business process modeling while sharing its master data (also known as common data or object glossary) with other tools like ARIS® or System Architect. 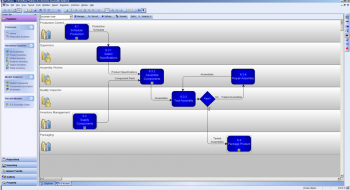 ProVision business process models can be exchanged with other repositories such as SAP® Solution Manager or they can be leveraged to design user acceptance tests for better integration testing of end-to-end processes. 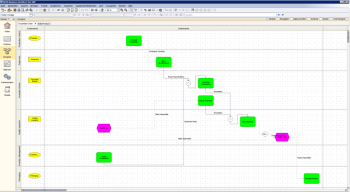 Moreover, Microsoft® Office Visio® could be used for process mapping and the outcome can then be loaded into ProVision workflow models making Visio an easy-to-use front-end for ProVision. Such flexibility of using, re-using and sharing model data is crucial for enterprise architects who wish to employ the most suitable tools for their missions.